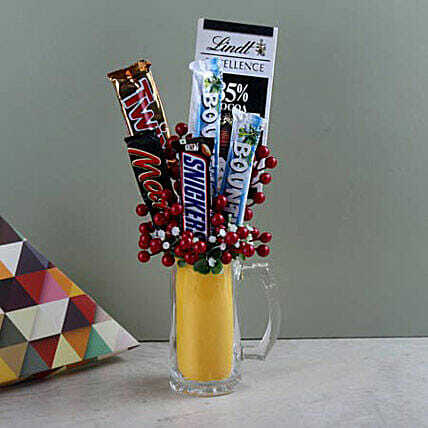 Beer mug arrangement with 2 Bounty, 1 Mars, 1 Sneakers, 1 Twix and 1 Lindt excellence decorated with red African berries is a perfect chocolaty affair to deal with. It can offer you mouth-watering chocolates that can leave you asking for more. Savour these chocolates to your fullest with your special ones and you would not feel guilty of consuming those extra calories at all.